In the Old Testament there are four 'major' prophets (Isaiah, Jeremiah, Ezekiel, and Daniel) and twelve much shorter books of 'minor' prophets (Hosea, Joel, Amos, Obadiah, Jonah, Micah, Nahum, Habakkuk, Zephaniah, Haggai, Zechariah, and Malachi). 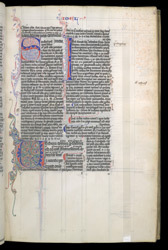 The twelve minor prophets were often treated as a group in glossed copies, such as this one. It may have been made at Canterbury Cathedral--the style of coloured foliate ornament used in and around the red and blue 'puzzle' initials is characteristic of Benedictine production--and it was certainly at Worcester Cathedral by the late Middle Ages.